Old style interface, but perfect new condition. Works great for 2.5' IDE hard drive. See pictures for item detail and more technical information on box. 2.5" Anodized Hard Drive CASE USB 2.0 FIREWIRE ENCLOSURE. Mad Dog 3.5” IDE Hard Drive Case w/ Hitachi 40GB. Just wiped the drive, works great. Not sure if it’s USB 1.0 or 2.0. Also has Firewire connections. Can use a different HD if you want. All item that we sent out has been thoroughly tested and verified to be in full working order. LIKE NEW: Shows no sign of use. Very Good: Noticeable signs of wear from normal use. GOOD: Noticeable signs of wear from normal use. Mad Dog 2.5" Aluminum Anodized Hard drive enclosure. Mad Dog Firewire DVD case. USB-2 also. Used to remove the Drive. Great condition. Fan cooled. for your safety and ours. delays a resolution to ANY issues you may have. See our photos for yourself, The item pictured is the exact item being sold. MAD DOG DOMINATOR 3-in-1 PLUS EXTERNAL USB 2.0 52X CD-RW. Condition is Used. Shipped with USPS Priority Mail. Mad Dog 52x CD-RW Dominator. Ripping and backup software included. Used but still like new. External USB 2.0. 48x (CD) / 16x (DVD). 48x (CD) / 16x (DVD±R) / 4x (DVD R DL). DVD±RW ( R DL). 24x (CD) / 4x (DVD±RW). USB 2.0 Connector Cable. Installation and USB Drivers CD. Model # MD-16XDVD9-8XE. 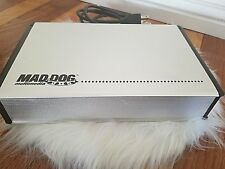 Mad dog MADDOG DVD-ROM 16x entertainer in original box. You are looking at a Mad Dog 16x DVD-Rom. mad dog multimedia mega vault 2.5 in aluminum hard drive enclosure. Condition is New. Shipped with USPS Priority Mail. MAD DOG DOMINATOR 52X CD-RW. Used, Great condition. 52x CD-R/32x CD-RW/52x Reader Reader/USB 2.0. power cable. USB cable, Manual. Drive only. HTML clipboa. HTML clipboard. IDE Host Interface PIO I-4, Ultra DMA 0-2, Multi-word DMA mode 0-2. • Type: DVD±RW (±R DL). • 8x (DVD R DL). • 8x (DVD RW). • Interface: IDE. • 6x (DVD-R DL). • 16x (DVD). • 16x (DVD±R). Read Speed. Used - but good shape. Relatively noisy fan. Dominator External USB 2.0. THE PHOTOS CLEARLY SHOW THE CONDITION OF THE ITEM(S)! Model# MD-52XCDEX. ONLY WHAT IS SHOWN IN THE PHOTOS IS INCLUDED IN THIS SALE. Justlink technology witch prevents writing errors. Just wright technology witch optimizes writing speeds. Audio Cable. Nero CD Recording Software. Applications and information CD. Incredible Ripping Speeds ripping software included 52x writer: write to CDs up to 63% faster than older 32x writers. New in box, originally from Comp. USA 2007. MAD DOG DOMINATOR InternalFloppy Drive. Mad Dog Dominator External plug-n-save USB 3.5" Floppy Drive Model MD-ED1F Good Used Working Condition. THINK GREEN. Every inquiry is of utmost importance and we treat it as such. We strive to provide 5-star service in every category you can rate us on! We greatly look forward to working with you! Local pickup is always an option. Can also be used to back up your hard drive. Happy to help. 3 feet off.